The Hype! Agency, a leading event staffing agency in the experiential marketing industry announced today they have won Inavero’s 2016 Best of Staffing® Talent Award for providing superior service to its talent. This is Hype’s fifth year winning this award! “We take pride in providing the best service in the industry and we are proud and honored to be recognized for our efforts in this way.” The Hype Agency’s Founder and CEO, Dayna Gilchrist said. 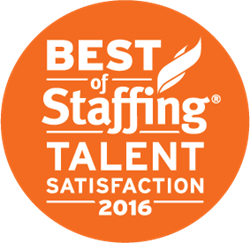 Presented in partnership with CareerBuilder, Inavero’s Best of Staffing Talent winners have proven to be industry leaders in service quality. Award winners make up less than two percent of all staffing agencies in the U.S. and Canada who earned the Best of Staffing Award for service excellence. The Hype! Agency received satisfaction scores of 9 or 10 out of 10 from 88.3% percent of their talent pool, significantly higher than the industry’s average of 49 percent. The Hype Agency provides top quality event staffing and experiential event execution partnership for its marketing agency clients. 2016 marks Hype’s tenth year or providing brand ambassadors nationwide for sampling events, trade shows, street teams, in-store demos, bar & nightclub promotions, mobile marketing tours, sporting events, and more! If you are in search of an event staffing agency and execution partner for your upcoming mobile tour, experiential marketing campaign, or PR stunt, there is only one choice, The Hype Agency! Contact us today and let's create some buzz!